November 9th officially marks the kick off of Gatlinburg's Winter Magic Festival! If you've never experienced the beautiful winter season in Gatlinburg, you're in for a real treat! For guests planning romantic weekend getaways, holiday vacations, or just a short trip with your family, we've made a complete guide on Winter Magic in Gatlinburg. You won't want to miss these special events, activities, and sights that bring the magic of winter to life! What is Winter Magic in Gatlinburg? Winter Magic is a season-long celebration of winter in the Smoky Mountains. In addition to parades, events and crafts fairs, Winter Magic is a chance to see Gatlinburg decorated in over 3 million Christmas lights. From festive snowflakes to elaborate light displays, you can explore mile after mile of beautiful lights in Downtown Gatlinburg. You'll even find special light displays of local Smoky Mountain critters like foxes, rabbits, bears and squirrels. Other additions to the lineup include snowmen, rocking horses, and dancing fountains of light. For over 20 years, visitors and locals alike have flocked to Gatlinburg to see this charming mountain town show off its Christmas spirit! How Long Are the Gatlinburg Christmas Lights Up? The Christmas lights in Gatlinburg are officially lit at the Gatlinburg Winter Magic Kick Off Event on November 9th. Because Gatlinburg has made the switch to stunning LED lights, the city is able to keep the lights burning for over 120 days at the fraction of the cost of traditional Christmas Lights. 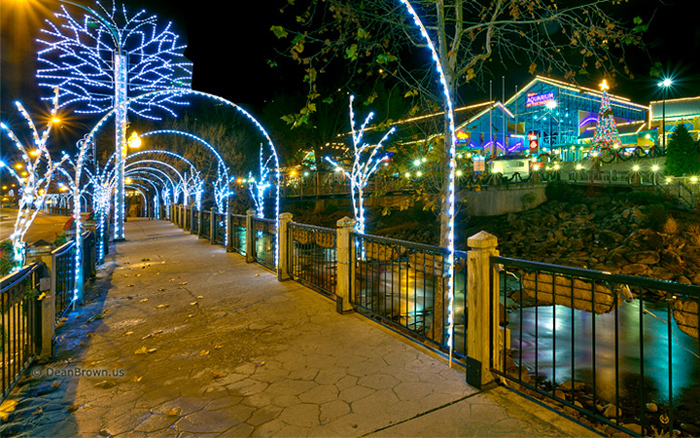 For this reason, vacationers in Gatlinburg can enjoy the festive lights until late February. Insider Tip: The Christmas Lights of Gatlinburg are particularly impressive when viewed from the Gatlinburg Space Needle or the By-pass overlook. To help you get the most out of Gatlinburg in winter, here's a breakdown of the 8 best things to during the Winter Magic festival in Gatlinburg. Come experience the first day of Winter Magic in Gatlinburg with a delicious bowl of chili at this fun downtown event from 5:00 pm to 8:00 pm! The annual chili cook-off is a chance for Gatlinburg's best chefs to show off their best recipes and compete for the top prize. Better yet, you can sample all of these delicious chilies for yourself! Tickets for the chili cook-off are only $10 per person. You'll enjoy games, music, and steaming bowls of chili in Downtown Gatlinburg from 5 pm to 8 pm. The festival is also a chance to honor America's veterans and marks the first ceremonial lighting of the Winter Magic Christmas lights. Take a ride on the Trolley Ride of Lights to enjoy a tour of the beautiful Christmas light displays in Gatlinburg. This heated trolley ride ensures guests can sit back and simply marvel at Gatlinburg's stunning Christmas lights. Trolley Rides begin at Ripley's Aquarium of the Smokies at 6:30, 7:30, and 8:30 every evening. Tickets are $5 per person. If you find that tickets are sold out, you can take a tour using the official Gatlinburg app or you can find printed maps available at the Gatlinburg Welcome Center. After a terrific Thanksgiving in Gatlinburg, you'll want to race to find great deals on Black Friday in the Smoky Mountains! Gatlinburg is a great place to find unique gifts and handmade crafts – perfect for taking care of your Christmas list! If you're in town over the holidays, you won't want to miss this lively street performance in Downtown Gatlinburg. These merry carolers bring Christmas cheer, authentic Smoky Mountain music, and local folktales to life. These shows are free to the public and you can often find performers in places like the Village Shops. Just in time for Christmas shopping and decorating, two of the biggest Craft Show events of the year come to Gatlinburg during Winterfest. This free crafts show at the Gatlinburg Convention Center brings in the best artists and craftspeople in the Smokies to show their one-of-a-kind creations. Be sure to check out these crafts shows to find a special Christmas gift or a treat for yourself! The holidays are a time to be thankful for what we have and to give back in gratitude – this is what the Festival of Trees is all about! This community event raises money for the Boys & Girls Club of the Smoky Mountains – a local organizing dedicated to enriching the lives of young people in Sevier County. This beautiful Christmas event in the Gatlinburg features craft making, pictures with Santa Clause, and a beautiful forest of decorated Christmas trees to explore. Perhaps the greatest Winter Magic event of all is the Fantasy of Lights Christmas Parade. Step off is at 7:30 PM and the parade marches from traffic light #1 to traffic light #10 in downtown. Be aware that this popular parade drew nearly 80,000 spectators in past years. With this many parade attendees in the small town of Gatlinburg, the crowds and traffic can be considerable. 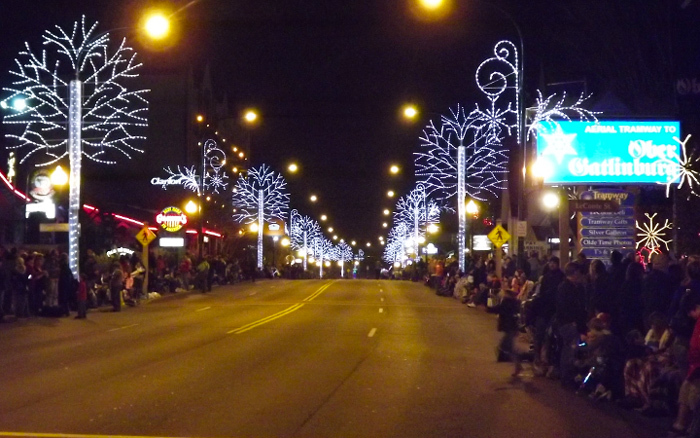 Be sure to arrive early to find a great spot to view this fantastic Christmas parade! To fully experience the magic of the holidays in the Smoky Mountains, why not book a log cabin rental in Gatlinburg, TN? A spacious Gatlinburg cabin would offer plenty of room for your family and friends. Better yet, you could enjoy a beautiful location near all the Winter Magic events and fun attractions in Gatlinburg, TN! What's your favorite thing about winter in Gatlinburg? We'd love to hear your thoughts in our comments section!